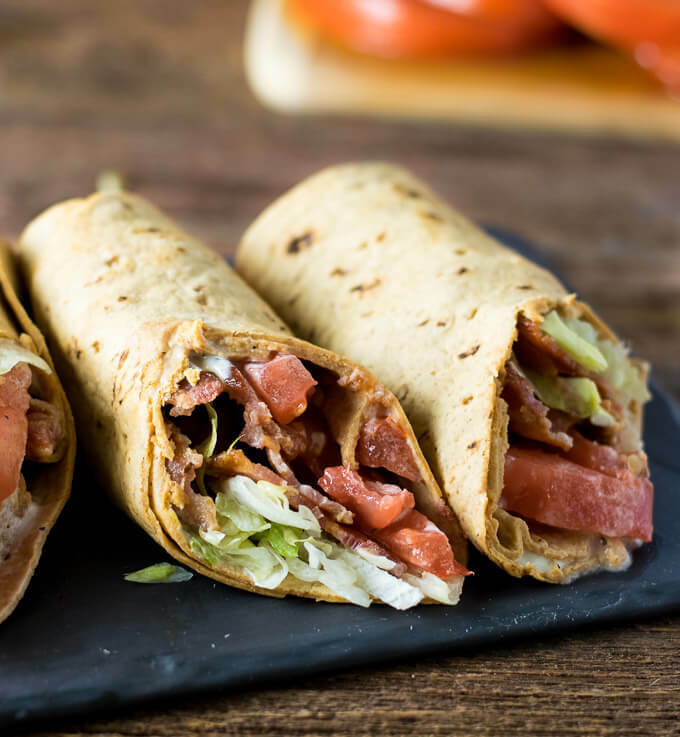 These flavorful BLT Wraps are loaded with crisp thick cut bacon, fresh lettuce, basted tomatoes, and a mouthwatering sauce that makes this BLT completely out of this world! “Secrets, secrets, are no fun. Secrets, secrets, hurt someone.” Who says you don’t learn life lessons on my website! Well, the good news is my secret sauce is only a secret to those who don’t read my BLT Wraps recipe. I simply couldn’t think of a more enticing name for it. 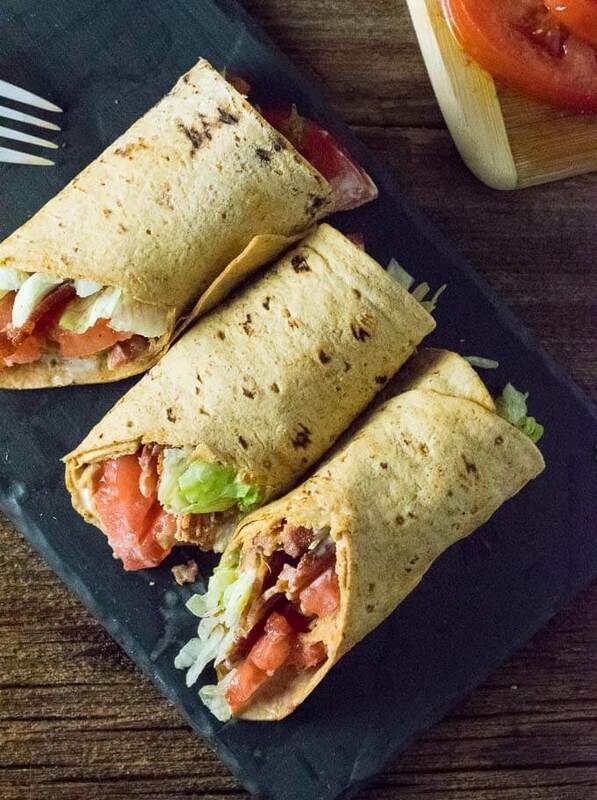 Regardless of what you call it, this sauce is the secret to transforming this BLT Wrap from ordinary to slap-yo-mama delicious. 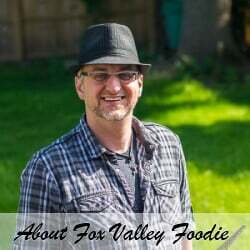 Disclaimer: FoxValleyFoodie.com does not recommend slapping mamas. You can use this sauce on any traditional BLT as well. I actually got the idea for this sauce from the marinade I use in my Gourmet BLT recipe. However, I have since come to the conclusion that it doesn’t pay to marinade the tomatoes. Simply basting them with the liquid is equally as effective. The best bacon to use for a BLT is thick cut bacon, in my humble opinion. You want it’s crisp, meaty, presence to take center stage in each bite! BLTs are also perfect for the month of August because flavorful tomatoes are abundant this time of year. Locally grown, in-season tomatoes will always taste WAY better than typical grocery store tomatoes you buy the rest of the year because they have time to ripen on the vine and develop more flavor. Grocery store tomatoes and picked green for transportation and artificially ripened before proper flavor develops. Tomato cutting tip: It is best to use a serrated blade to slice a tomato. The teeth on the blade will tear through the tomato skin more easily, ensuring you do not have to press down and squish the tomato with each slice. A bread knife actually works very well for this. 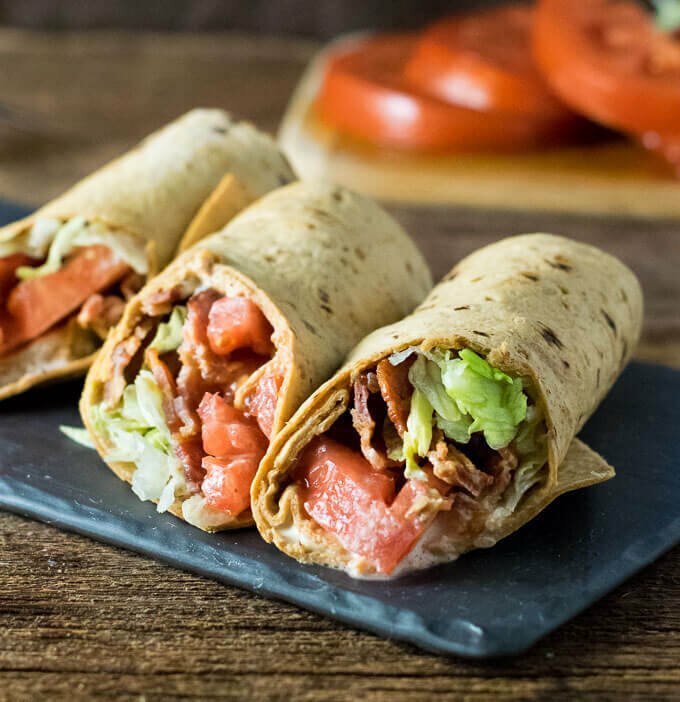 These flavorful BLT Wraps are loaded with crisp thick cut bacon, fresh lettuce, basted tomatoes and a mouthwatering sauce that makes this BLT completely out of this world! Fry bacon in a skillet until crispy. While bacon is cooking, cut tomato slices in half lengthwise and add to a large dish with olive oil, red wine vinegar, salt, and pepper. Turn tomatoes and brush each side with the mixture to ensure full coverage. Add mayo to a small dish and drain 1 tbsp of the tomato basting mixture (olive oil, red wine vinegar, & tomato juices) into the mayo and stir to combine. Open wrap on a plate and smear 1 tbsp of the mayo mixture onto wrap. Top with lettuce, 3 strips of bacon, and 3 tomato halves. Roll wrap to close and serve. IF YOU LIKED THIS RECIPE you will love my Fire Roasted Tomato Soup with Bacon recipe too! 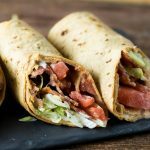 If you enjoyed reading my BLT Wraps with Secret Sauce recipe then you should probably like me on Facebook and follow me on Pinterest too. That’s what I would do at least, because if you don’t get to know me but you still use my recipe it is kind of like taking candy from a stranger, and your mom taught you not to do that. Don’t disobey your mom, subscribe to Fox Valley Foodie today. Bobby Nelson’s smoked bacon is highly recommended! Your recipe arrived just in time for lunch! Had no red wine vinegar, so I used balsamic. Had thick-sliced bacon in the ‘fridge and some local ripe tomatoes on my counter. BINGO! Thanks for the great idea! Just discovered your blog and made this for lunch. It was delicious! Thank you! Can you link the wraps you used for this? Thanks!